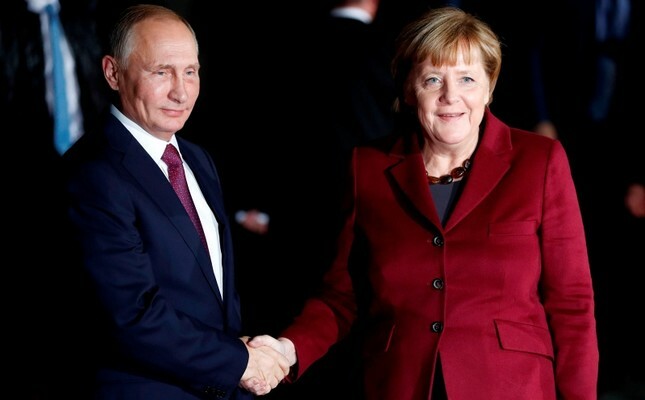 German Chancellor Angela Merkel and Russian President Vladimir Putin are due to meet on Saturday for their first bilateral summit in Germany since Russia annexed neighboring Ukraine's Crimea region four years ago. The meeting offers the leaders an opportunity to strengthen ties in the face of abrasive policies from US President Donald Trump, including US tariffs on EU steel and aluminum and expanded US sanctions against Russia. Merkel and Putin last met in the southern Russian city of Sochi four months ago for talks that focused on the Ukraine crisis as construction began for an expansion of a natural gas pipeline directly from Russia to Germany. Ukraine's leadership has staunchly criticized the pipeline project, Nord Stream 2, as undermining the European Union's efforts for Russia to return Crimea and resolve a simmering pro-Russian rebellion in eastern Ukraine. Trump said last month that Germany is "totally controlled by Russia" through commodity imports as exemplified by the expansion of the pipeline. Saturday's meeting, to take place at the government guest house Schloss Meseberg outside Berlin, was expected to cover the Ukraine conflict, the Nord Stream 2 pipeline and the Syrian civil war, according to a German government spokesman. Merkel has encountered political pressure at home for opening Germany's borders to hundreds of thousands of refugees in 2015. The decision led to the rise of the upstart anti-immigrant Alternative for Germany (AfD) party.